The Kuvings SC Series Silent Juicer is Kuvings’ second generation upright masticating juice extractor offered in four color variants. This lineup has been upgraded with the innovative no-drip Smart Cap. This allows you to create different juices inside of the juicer without worrying if you’re going to spill it on the counter. Simply close the cap and drop in one ingredient at a time until your juice is thoroughly mixed. With a flip of the cap, fill your glass or the collector bowl with your freshly mixed juice. The tough Ultem auger slowly crushes your produce at only 80 RPM. This happens before pressing it against the juicing screen extracting high quantities of juice without damaging the essential enzymes, antioxidants, and vitamins. Any plastic coming into contact with your food is BPA-free. In addition, the durable GE Ultem plastic is eight times harder than most plastics. Kuvings SC weighs approximately 15 pounds and does not come equipped with a handle. This sturdy juicer comes designed with a flare of sophistication. It’s available in burgundy, silver, chrome, and black. Thanks to the vertical design, it takes up less space on the counter and will fit under most cabinets. It is powered by a 240-watt and 120-volt brushless AC motor that makes less noise than if you were to have a conversation with a friend. Since the auger rotates more slowly than a fast juicer, the only sounds you really hear are the hum of the motor and crunching of produce. While Kuvings SC is easy to assemble and use, it takes some preparation before you can begin the juicing process. Line the bowl up with the locking pins on the base and lock it into place, then line up the remaining parts to finish putting it together. Press the auger screw down into the bowl and lock the drum lid into place. A magnetic safety sensor prevents operation if the parts are not assembled properly. The integrated ventilation system prevents overheating. Chop large fruits and vegetables before you attempt to drop them down the feed chute. It is important to note that since this is a single-auger vertical masticating juicer; fibrous greens like celery need to be chopped into short pieces. If you do not take the time to cut these items up, then the fibers will most likely wrap around the auger, therefore producing very little juice which is the opposite of the yield of juice celery produces. This is a common complaint among vertical masticating juicer owner, but it is easily remedied by taking these steps. Another thing to remember: this juice extractor self-feeds. Do not jam items into the feed chute or press down hard using the pusher. In fact, don’t even use the pusher unless it’s absolutely necessary. Allow the auger to work at a steady pace pulling things into its blade to be crushed and slow-pressed. Even though the auger is capable of crushing them, it will work more efficiently if you slice them into smaller pieces. If the machine becomes obstructed, then press the reverse function to move the items back up the bowl to unjam it. The components of Kuvings SC Series are not dishwasher safe. However, everything takes seconds to clean with the exception of the juicing strainer. Since it comes with a juice cap, use this to your advantage when it comes time to clean your juicing machine. Close the cap, fill it with water and allow it to run for a minute, rinsing away leftover juice and pulp from the mesh strainer. The patented cleaning tool is handy, helping you cut down on cleaning time. Place it over the top of the juicing strainer and rotate it back and forth to dislodge any pulp remaining in the screen. Scrub everything in warm, soapy water. Be certain to remove the pulp, otherwise, it becomes difficult to remove at a later period. Additionally, over time, any leftover sediment and pulp will begin to build up, leaving behind dried bits of produce. To avoid this, clean it as soon as you finish juicing. If you can’t clean it right away, give it a quick rinse down and scrub the juicing strainer. Slow juicers are the best way to extract fresh juice from fruits and vegetables. Instead of shredding the produce and pushing a ton of oxygen through the produce—breaking down the vital enzymes—this juice maker gently presses and removes the juice—minimizing oxidation and preserving the nutrients fundamental for maintaining a healthy life. Not only does this electric juicer maintain the integrity of the produced juice, but it also tastes rich and full of flavor. Thanks to the dual-step masticating process, the flavor is always delicious and unspoiled. Something to consider about masticating juicers, most of them produce more pulp output than centrifugal juicers. If you are not a fan of pulp in your juice—and many people are not—either pour it through a sieve or pour it back through the juicer to allow the pulp to be strained from the juice. One of the excellent advantages to using this juicer is the extended shelf life. Drink it right away or make batches to store in the refrigerator to be enjoyed later. Just make sure to use an airtight lid and fill the container as close to the brim as possible to push the oxygen out of it. Use glass, plastic or stainless steel to store your favorite juice. Usually, your juice will stay fresh for up to 72 hours in the refrigerator, but who waits three days to drink freshly prepared juice? I certainly don’t! Hard produce includes apple, coconut, broccoli, yakon, turmeric, pepper, cauliflower, beets, bitter gourd, cucumber, fennel, pear, asparagus, celery, pineapple, pumpkin, garlic, carrots, watermelon, ginger, sweet potato, and cilantro. Leafy greens include wheatgrass, beet greens, pine tree needles, spring onion, parsley, spinach, dandelion greens, basil, lettuce, kale, moringa, peppermint, brussels sprout, collard greens, and cabbage. Though Kuvings SC Silent Juicer can process leafy greens, an 80 RPM vertical masticating juicer is not ideal for juicing wheatgrass and green leafy vegetables on its own. It should be done along with other produce to aid in juice extraction. Don’t get me wrong here, it still outperforms centrifugal juicers but it’s just not as efficient as horizontal masticating juicers. Newer vertical masticating juicers running half that speed (43 RPM) can now process leafy greens and wheatgrass at a more efficient rate. Citrus fruits include grapefruit, lime, mandarin, tangerine, lemon and orange. You can also process soft produce such as strawberry, papaya, peach, melon, pomegranate, cranberries, mango, avocado, kiwifruit, grapes, tomato and blackberry for making a puree. You can also use this machine for making soy and almond milk with this machine. The Kuvings SC Series effectively extracts nutritious juice while maintaining the natural flavor of the juice. Store bought juices lack flavor and the essential nutrients have mostly been destroyed through the pasteurization process. This cold press juicer comes with a detachable Smart Cap to allow for easy mixing, rinsing, and reducing spills or drips during operation. You also have the option of purchasing the Kuvings Frozen Dessert Maker Attachment. Create sorbets, other frozen desserts, baby food, and even mince fruits or vegetables. This juicer efficiently juices leafy greens and wheatgrass, but only when juicing them with dense items such as carrots or celery. When juicing leafy greens alone, triturating or masticating juicers are always going to be the best options. If you’re short on counter space though, this juicer is a worthy runner-up. If you already juice your produce using a centrifugal juicer, then this one will take some getting used to because it works at a slower pace, but the quality of juice is far more superior. Plus, you will notice right away that it is much quieter. Trust me, your ears will thank you for using a quiet, masticating juicer. 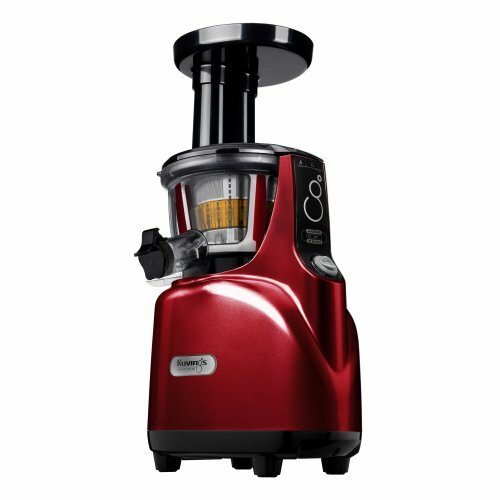 This particular model of juicers is covered by a lengthy 10-year warranty. When you’re considering a juicer like the Kuvings SC Series Juicer, remember that you are not just buying a fancy product; you are making an investment into your health. Isn’t your health worth it?